There are some new bands that stand out. Every year I get a lot of music for review, and I tend to think I´ve heard it all before. But every now and then a new band proves me wrong. THE ANDROID MEME hails from Toronto and are not prone to standard solutions. The bow to bands like RUSH, of cause, but also to the likes of MUSE, SKINNY PUPPY and TOOL. The mix and freshness is enough to get me raving on about them for ages. But who better to tell the true stories behind the band, their hidden meanings and various layers than vocalist Stefano Amelio. 1/Please elaborate on the album, the theme, the influences, the creative process etc...? - The album was recorded in stages over a year and half. Some songs were written in the studio and some were written well before any recording was done. The themes across the album vary from political to spiritual and to the personal. emotion over lost love and the importance of overcoming personal depression. There are strong Masonic and esoteric/occult themes as well which is expressed in the symbolism of the band visually and lyrically. Freemasonry and many of the ancient teachings it is based upon teach us to look deep within our reality and ourselves to find our potential as people and to realize how vast and mysterious our existence really is. The album title ”Ordo Ab Chao” is Latin for ”order out of chaos” and this generally alludes to how much of everything in our existence is dependent on the eternal cycle of opposites and how they interact to justify each other. The songs on the album are a mix of positive and dark themes and this expresses the title's meaning. 2/ Your music span over a number of genres, how did you come up with the concept and does it differ from your previous bands? I may be tone deaf, but where is the MÖTLEY CRUE part? - Our creative process is a mixture of writing as a group where each member brings ideas and those ideas are worked out and arranged so as to best suit the song. We do not try to stick to one style because we all enjoy different types of rock music. We like to be more metal at times and we like to have more commercial songs as well. We try to incorporate a wide range of influences but we do not really try to emulate anything too closely. This has been my only real band as I have carried the project over a few years and previously there were a completely different line up of members. 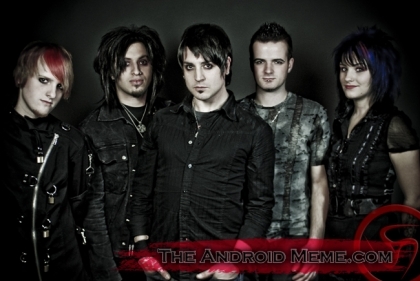 I have always wanted the Android Meme to conceptually express intelligence and balance with a strong electronic rock feel. It started as a home recording school project and then I decided to form a full band to make an attempt to reach the masses. 3/ Which bands would you compare yourselves to? I can´t really find any good equivalents? - It is very hard to compare us to other bands but I would say we can be like Muse, Tool, Rush, Skinny Puppy and a whole lot of others. 4/ How has the album been received, critically, by fans etc? The album has been getting great reviews worldwide so far, and despite some of the criticism of our variance in style people seem to appreciate it in the end. We don´t want to write the same song over and over and when you mix that type of musical integrity with themes meant to provoke thought and awareness, it tends to turn out all right. 5/What other hidden and double meanings are there apart from the title track? Any you care to share? - Some songs have double or triple meanings and a lot of that is because symbolism is very important to us. As mentioned earlier, we like to layer meanings so that the listener can always discover something new to further enlighten them on their listening journey. I would like to mention that balance and cycles are very important to note. As well as the rich symbolism of many esoteric/occult teachings can be found by those who have been exposed to such and perhaps the less aware can learn something interesting and new by uncovering this symbolism. 6/What happens next? Will there be any touring in Europe, an album number two etc.? - At this stage the band is trying to keep the promotion machine going and we do plan on touring the US and Europe when we find enough interest and demand for us to perform on tour. It is very costly and when the time is right we will attempt to find the funds necessary to tour as many places as possible. We hope this (a new album) occurs sooner than later. We have started writing new songs for a second release but it is not a priority right now. All I can say is the next album will have a more emphasis on personal evolution.